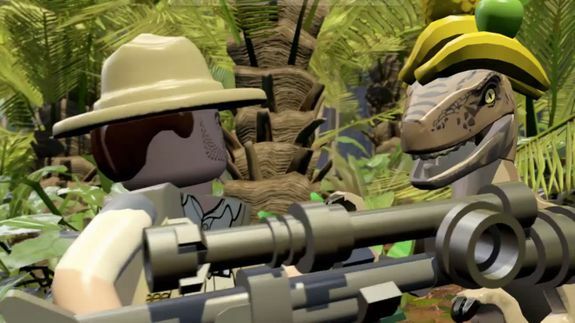 An all-new dino dominates the latest 'Lego Jurassic World' trailer - trendistic.com: ever tried. ever failed. no matter. try again. fail again. fail better. Who knew that the sight of genetically recreated dinosaurs terrorizing innocent civilians could be so… adorable? Lego Jurassic World runs through the events of all four of the series’ dinotastic movies, including the upcoming Jurassic World. This new trailer takes a tour of the park and its many attractions. There are plenty of familiar sights, but the bigger Jurassic nerds among you ought to appreciate a few brief looks at Indominus Rex, the mutant mega-dino that is said to be Jurassic World‘s big, bad threat. It’s the all-white T-Rex-looking thing seen in the trailer.